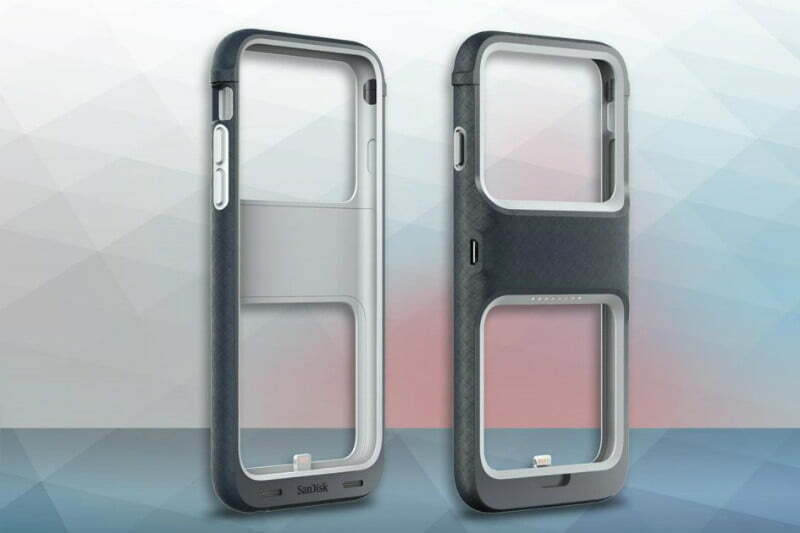 If you’re stuck with 16GB of internal storage on the iPhone 6 or the 6S and find yourself running out of space, you may want to take a look at SanDisk’s iXpand Memory Case. It’s better than carrying around additional storage separately for sure, and it adds a significant bump in storage while protecting your phone. The company is offering three different storage sizes — 32GB, 64GB, and 128GB, with the respective prices of $60, $100, and $130. The Memory Case is also modular, so for an additional $40, you can slap on a small 1,900mAh battery pack on the back. That should be a little more than enough to recharge the iPhone 6S from zero to 100 percent. It’ll add a hefty bump to your phone, but you’ll only have to keep it on when you’re low on battery. Diving with your expensive Apple Watch isn’t recommended, but that hasn’t stopped people from trying. The Watch can surprisingly can handle its own in shallow depths, but you still might want to get a waterproof case. 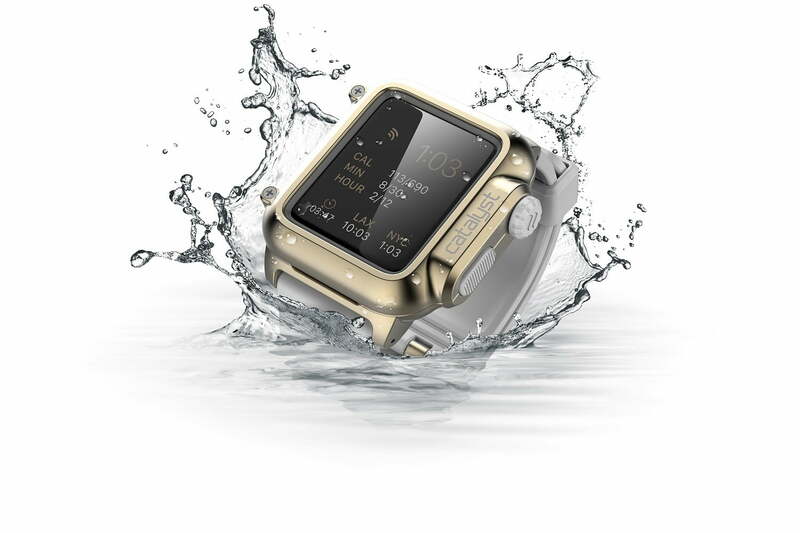 Catalyst has been offering its regular Apple Watch waterproof case for a while now, but it may not tickle your fancy. The dust- and shock-proof case wraps your $400 watch in silicon, which is not exactly what you want on a fancy smartwatch. To provide a more premium feel, Catalyst is releasing a limited edition aluminum case for the 42mm version of the Apple Watch. It performs exactly the same as the previous version, so you’ll be able to take your Apple Watch down under 165 feet of water. The case’s availability is limited, but it’s available for purchase now for $200. It comes in gold, silver, or gray. If you’ve ever tried to walk and text at the same time, you know the feeling: Your phone balancing precariously on the edge of your palm, mere inches from tumbling to the unforgiving sidewalk below. It’s a problem that artist Adam Hirsch aims to solve with HandL, a smartphone case that acts as “an organic interface between hand and phone.” The elegant, stitched leather case sports a rear-facing leather bit attached by elastic. Once secured between two fingers, the strap fits snugly, ensuring the attached phone doesn’t take any unexpected dives. And, as a nifty bonus feature, the HandL doubles as a makeshift stand. The HandL’s available for the iPhone 6, 6S, and 6S Plus, and the Samsung Note 4 and Note 3, and comes in a variety of colors including black, patent leather, grey, brown, and white. It normally ships for $50 from the company’s store, but HandL is hosting a half-off sale on several models this month. 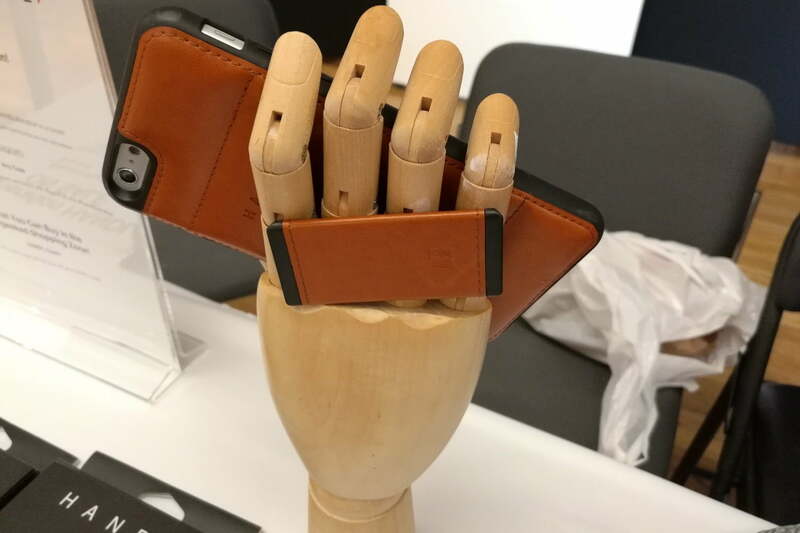 Future models may dispense with the case component entirely, said Hirsch, and opt for suspender-like straps that attach to the back of your phone. Power bank company MyCharge is perhaps best known for its colorful array of power banks and battery-extending cases for the iPhone, iPad, and Samsung’s Galaxy series of devices, but it’s breaking ground in a novel novel category: VR accessories. 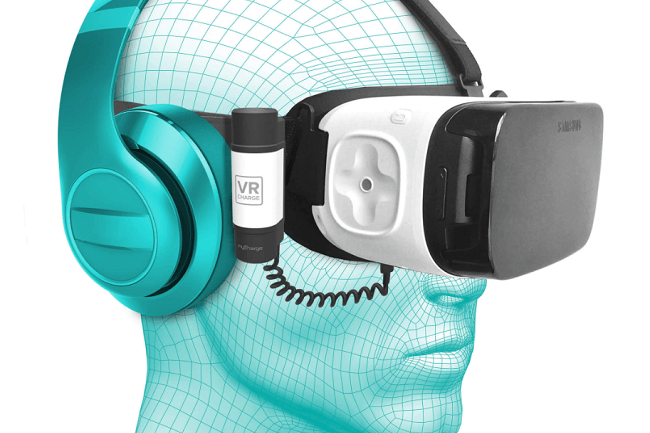 At CE Week in New York City, it took the wraps off PowerGear-VR, a lightweight, compact battery that affixes to the side strap of a Samsung Galaxy Gear headset and plugs into its Micro USB port. Portable keyboards designed to work with your mobile are a dime a dozen, but comparatively few require no power or arduous pairing process. Enter One2Touch’s SlimType, an accessory for Samsung’s Galaxy series of smartphones that leverages NFC to sync. The process couldn’t be simpler: Download the SlimType companion app, slot your smartphone in the attached case, position it next to the keyboard, and you’re good to go. 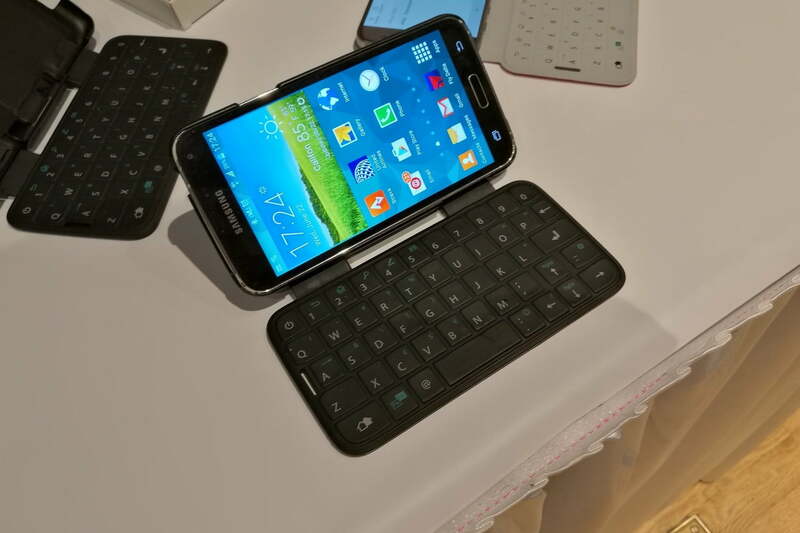 The keyboard acts as a seamless extension of your phone’s software keyboard. It’s got hotkeys, too, for one-touch access to your calendar, contacts, and email. And importantly, the SlimType’s comfortable – its textile keys are soft, scratch-resistant, and lightly resistive to the touch. The SlimType is available at the introductory price of $40, and ships in your choice of cherry red, black sapphire, and white pearl.